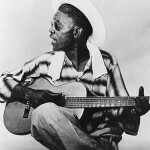 January 30, 1982 Sam John “Lightnin” Hopkins, country blues guitarist, singer and songwriter, died. Hopkins was born March 15, 1912 in Centreville, Texas. He developed a deep appreciation of the blues at the age of eight but did not make his first recording until 1946. By 1960, Hopkins had cemented his reputation as one of the most compelling blues performers and he made his debut at Carnegie Hall in October of that year. Throughout the 1960s and 1970s, he released one or more albums a year and toured, playing at major folk festivals in the United States and internationally. His recordings include “Last Night Blues” (1960), “Lightnin’ Strikes” (1965), “My Life in the Blues” (1967), and “Freeform Patterns” (1968). It is estimated that Hopkins recorded between 800 and 1,000 songs during his career and recorded more albums than any other bluesman. His informal lifestyle was captured in the 1967 documentary “The Blues According to Lightnin’ Hopkins.” There is a statue of Hopkins in Crockett, Texas and a state historical marker was dedicated to him in 2010 in Houston, Texas. Biographies of Hopkins include “Lightnin’ Hopkins: Blues Guitar Legend” (1995) and “Lightnin’ Hopkins: His Life and Blues” (2010).